Alfa USB Long-Range WiFi Adapter I love my Macbook Pro but I’ve never been happy with the wifi reception — while traveling with a friend, he could regularly see 3-4 more hotspots on his Android smart phone than I could with my laptop. I remembered reading a post a couple of years ago where Anil over at FoxNomad had mentioned a wifi booster of some sort, so I poked around the interwebs a bit and found the Alfa USB long-range WiFi adapter on Amazon. At less than $30, it seemed worth trying, even though I wasn’t sure if I’d be able to get it to work on my Mac. After some head-scratching and digging through forums I did get the driver and application installed and I can say that so far it’s speeding up my download speeds and grabbing signals I can’t see without it (I’ll post a full review after I’ve had a chance to test it). The app is a little clunky and it’s a pain screwing on the antenna every time but if that means I can work in my room rather than in a hotel lobby or at that cafe across the street, I’m all for it. It’s fairly easy to use: screw in the antenna, plug in the USB and launch their app. It will show a list of wifi nodes. Select one, click ‘connect’, wait for it to log in and then switch from wifi to the the USB connection in your network preferences and you’re done. I haven’t found a way to get it to remember passwords, though, so it can be a hassle typing it in each time. They offer two additional antennas that should reach even further but I wasn’t able to have them delivered in time. I don’t know how durable it is –it’s made of cheap plastic– but it weighs nothing and if I can get 6 months use out of it it’s worth the price to me. Barska 10×40 Monocular When I first started this trip, I brought a sharp pair of $300 Nikon binoculars. Unfortunately, they weighed two pounds so they tended to stay in my main pack and didn’t see much use. After six months on the road they disappeared, either while in a bus’s cargo hold or from my hotel room. There are times when I’d like to see something closer up, so a monocular seemed like a good option. It only cost $40, has the same power as binoculars and only weighs 9 ounces, so I don’t mind cramming it into a corner of my day bag. And at that price, I’m not paranoid about it walking off again. The optics are pretty bright and sharp. It is a little slow to focus but I can live with that considering how little I’ll be using it. Timbuk2 Messenger Bag I’ve been really happy with my old Timbuk2 Swig backpack but after almost two years of daily abuse, it was starting to come undone. The stitching was coming apart on the main strap and –more importantly– the waterproof rubberized layer was in ribbons. I generally carry my laptop and camera with me, so being safe from an unexpected downpour is pretty important to me. And the Swig certainly performed well in that regard — my only real complaint was that it was just a hair too small for the SLR and required careful packing to fit everything in. 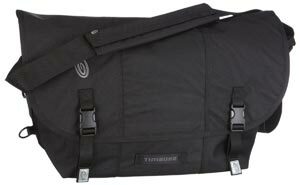 I’ve used Timbuk2 messenger bags for years — my main transportation has been a motorcycle for a decade or more and I have always been impressed with their durability and ability to keep the wet stuff on the outside of the bag. This one features a lot of pockets, which is always welcome, and has a narrow pocket for the laptop (though not a padded laptop sleeve as the old pack had). Everything fits easily and so far it’s comfortable. I generally carry my day pack slung off one shoulder so it feels pretty natural. At $70 for the large size, it’s more than I wanted to spend but I expect to get 2-3 years worth of use from it. Considering that I once spent $50 on a fancy high-tech shirt that I threw in the trash just 2 weeks into my trip, I think it’s a good investment. Added anything new to your kit lately? Hmmm…2 out of 3 of these items are some I never even considered. I look forward to your thoughts once you have been using the antena on the road…it might just be what I need- as long as it does make a difference. Liking it so far. Will definitely post an update. I started using a Timbuk2 messenger bag about 2 years ago after reading an article by David Pogue (who writes the tech column for the NY Times) writing that he’s used one for years. I travel a lot with a lot of stuff and it keeps my Mac and a ton of other gear safe and dry. Plus I often cram it with some clothes that don’t fit in my carry-on. It’s a really good product and the TSA-compliant model is great. I recently picked up one of those Alpha antennas as well. Liking it a lot. Just epoxied the thing to the front of my MacBook Air and got a super-short USB cable for it.